As a couple of Norfolk girls, we were pleased as punch to be invited to the Royal Norfolk Show to engage with even more of you out there! Since partnering with the Girl Guides we’ve been really lucky to work with them and even more lucky to be asked to join their (ahem, award winning) stall at the show. We got there bright and early on that first Wednesday, to make sure that our stall was spick and span – not least because it wouldn’t be long before the show judges would be coming to assess the tent. We were delighted when the Guides/Scouts tent that were were part of was awarded the Bonds Challenge Cup – given to the most effective exhibi t by a charitable organisation. We were chuffed to bits for them, lots of hard work paid off. We were warmly welcomed into the Guides tent and some Brownies were our first visitors, and it wasn’t long before our stall was buzzing. We had lots of fun thinking about what activities we would do on the stall at back Girl HQ, deciding on empowerment bunting and self-esteem fortune tellers. The bunting would get people thinking about what it good about girls, or what some of the good things or bad things about being a girl are, meanwhile the fortune tellers would help the youngsters to reflect on the things that they liked about their lives with the aim of building self-confidence and body-confidence. The fortune tellers were based on a Guides activity that counts towards their ‘Free Being Me’ badge, and so if you’d like to print one off at home and make one for yourself go ahead! You can find it by visiting this link and going to page 47. We asked people to write down four things they liked about their lives, and four things they liked about how they look. Lots of people, us included, found it hard to say what we liked about our looks and bodies. But at Day of the Girl Norwich we think its super important that we can have confidence in how we look, and can be able to find it ourselves, rather than looking to others for it. 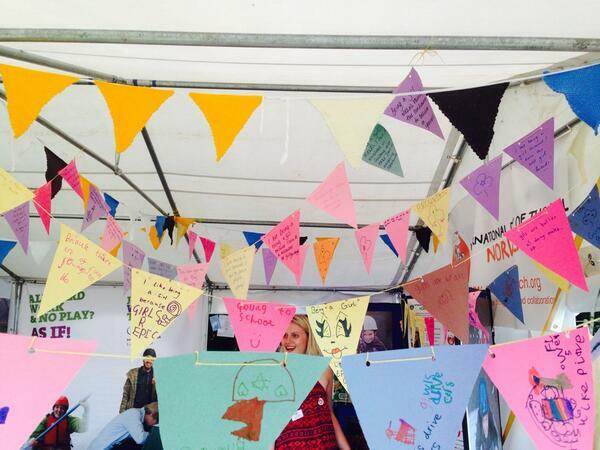 Our other activity, girl empowerment bunting was a way for everybody to get a chance to say what they liked about being a girl, or if they weren’t girls what they thought was good about girls, or maybe even some things that people thought was not very good about being a girl. We had loads of fun hearing what people had to say! Over the course of the next few weeks we’ll be uploading pictures of these pieces of bunting onto our GirlsRoar twitter feed, so be sure to follow us to join in with the conversation! Lots of our visitors were female, but what was great to see was a number of boys taking part. Our fortune teller activity was, we felt, especially important for boys. Many boys found it difficult to articulate what they liked about themselves, especially in terms of their bodies. We might sometimes forget that the focus we place on girls’ appearance might also make boys think that its ‘girly’ to think about their appearance, whereas we think its important that everyone has body confidence. We had a brilliant time at the show and there are some people that we’d like to thank for making it such a great experience. The first is to Alice Flowers who was with us with both of the days and managed to have enough energy despite both being an overnight camper AND cart race competitor! Our daily volunteers, BJ Epstein, Erica Horton and Sanna Inthorn (all of whom got to enjoy their very first Royal Norfolk Show), thank you for all of your help. Lots of thanks to Girl Guiding (and the Scouts) for letting us be a part of your family for the two days of the show. And of course, a BIG thank you to all of you that came to see us! Over and out from some very tired women at Girl HQ! Next Next post: We’re all going on a summer holiday…Tori and Sarah get busy with the archives!